Through our strategic partnerships with Purshe, Kaplan, Sterling; Global View Capital Advisors has access to an RIA friendly and comprehensive broker dealer. Through Ash Brokerage, the largest independent insurance distributions firm in the U.S., Global View Capital Advisors has access to a vast universe of insurance and annuity products. The Ash team of internal and external consultants provides professional services needed to offer clients the best options for meeting their insurance protection needs. Industry leaders in business transitions and valuations have determined that 70% of financial advisors truly own no more than their job. The Global View business model is designed to provide advisors the support and infrastructure needed for success without interfering with their ability to harvest the value of their life’s work. This all starts with having control of the clients’ confidential financial information, which as a Global View advisor you are contractually, granted ownership. The foundation of any successful business is a sound business plan designed around the strengths of the individual. Unfortunately financial services firms typically force individuals to adapt to the needs of the company, putting its’ needs ahead of both the advisor and clients. Upon affiliating with Global View, advisors are guided in developing a business plan based upon their strengths. With a thoughtful plan complete, the advisor can then access the appropriate product solutions and business development programs needed for creating a successful business. The Global View graphics design group produces high quality brochures and presentations to create a professional image to your clients and prospects. In addition, Global View advisors have access to both a personalized website and Linked-In profile that tells the unique story of Global View and the advisor. Our digital marketing team optimizes our advisors’ online presence to ensure it appears in searches for financial advice in their local area. Our marketing tools, profiling forms, comprehensive financial planning software, hypothetical portfolio analytical system, proposal generation system, Laser App document filling software and other technologies make the process of bringing on new clients easy, repeatable and efficient. Our technology platforms are completely integrated. Our proposal system generates a professional presentation which includes portfolio performance and risk analysis relative to benchmarks. In addition, all forms necessary for the custodian chosen will be generated and populated with the client data. Also, our client billing, institutional trading and performance reporting systems are completely integrated for timely and accurate data in servicing your clients. Our Advisor Service Team provides account opening as well as ongoing support with transactions, manager changes, transfers and many other service requests. At Global View we believe in the wisdom of teams both as a way to grow your business today and drive to higher business valuations in the future. We are experts in building teams with complementary skillsets and incentivizing them to support each other’s growth. Our Advisory Services Platform is available to both our affiliated advisors and RIA’s who act as a solicitor to the Global View platform. We provide access points and pre-negotiated rates with a large array of money managers and strategies for advisors who want to outsource all or a portion of a portfolio to third party managers. Our unique technology and trading capabilities allow us to offer managers at lower minimums and multiple managers can easily be blended into one account registration. Our platform has pre-existing relationships with several of the industry’s largest and most well recognized custodians. We also have the ability to link to additional firms through electronic feeds and direct connections to streamline your data aggregation and reconciliation needs. Access a team of investment professionals, including multiple highly credentialed CFA’s, MBA’s, CPA’s, and CFP’s on staff performing daily due diligence on existing money managers, in addition to screening and selecting new firms for consideration to our system. We have over 40 managers and over 200 strategies, mutual funds and ETFs that we monitor and maintain today. In addition we can simply provide access and technology linkage to managers or strategies an RIA firm selects through their own DD process. Trading directly with custodians or using a VWAP trading system? Our institutional quality trading desk will bring significant and measurable cost savings to you and your clients. In addition you can delink from trade risk and trade errors. A robust suite of basic reporting capabilities. Daily positions, tax lots, gain loss, performance, point to point returns, position performance, analytical views, along with customized monthly and quarterly reports. In addition, key metrics and business analytics about your practice are available for you to use to help manage and guide your own practice decision making. Have your billing calculated and fees either debited or credited. Collected fees are automatically ACH’d to your bank account. 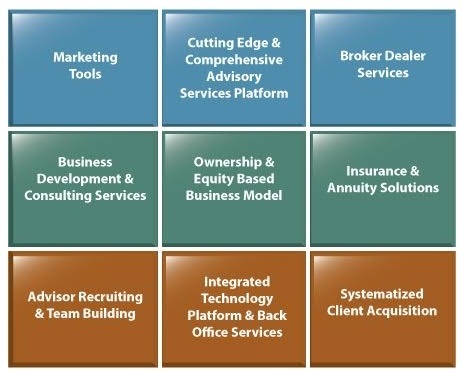 In addition to advisory fees third party managers and strategists are paid on your behalf. For RIA firms looking to deliver a new investment strategy to a broader marketplace our Emerging Manager Program will provide the systems and structure needed to build a track record and also the opportunity to offer the strategy to our affiliated advisors. We provide access to a number of liquid alternative and private credit solutions. They are included in our proposal tools, billing system and reporting software for a total solution for RIA’s looking to incorporate alternatives into a client portfolio when appropriate.